Tutorial - How to Install Remix OS 2.0 with Windows 7, 8, 8.1, 10 with Dual Boot. Recently Remix OS Developers have shared latest Remix OS for UEFI PC. In preview post we talk about Install Remix OS on PC laptop Hard Disk With Windows Dual Boot. If you are using Legacy Desktop/ PC you can check out that tutorial. 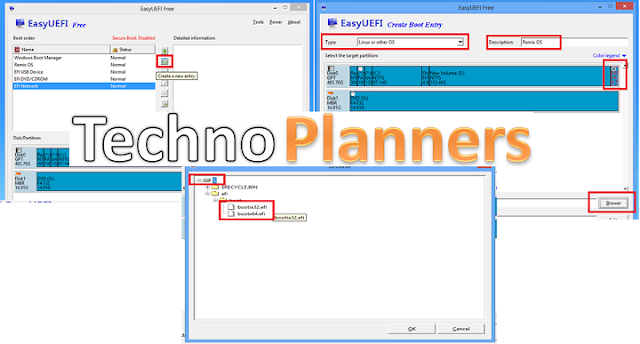 Download Remix Image for UEFI and EasyUEFI software from end of post. Then Install EasyUEFI on your PC. Now, Create a New partition atlest 10 GB and format it in fat32. Click Windows + R button, then type diskmgmt.msc and press enter button to start disk management. Now right click on any partition, then select shrink volume. Now enter the amount space to shrink 10000 then click on shrink button. Now you will get unallocated space. Right click on the unallocated space and select new simple volume and follow these instructions. Now Connect pen drive with PC and format it in Fat32. After format Run Remix USB Tool and Click on Browser button for the select remix image file, then click on OK button and wait for the process to complete. Don't remove the USB flash drive after process complete. After making a bootable flash drive. Copy all folders and files from flash drive and copy in your Remix OS partition that you create on your PC. After Copy All files in Remix OS Partition. Run EasyUEFI, then click on Add New Entry. Now Select type as Linux or other OS. Now Enter Name Remix OS (Or you can enter any name like android-x86) in the Description. After that, Select Remix OS partition from Target Partition menu. Now Click on Browser Button from below then click on + Button. Then double click on EFI then boots folder. Now Select Bootia32 for 32 bit Computer and select bootx64 for 64-Bit Computer then Click on OK Button. Then again OK button to save configurations. Now Shutdown your PC and Turn on using Boot Menu Key (F12 Key Work for Lenovo). There you can select Remix OS. After select Remix OS it will show Guest Mode and Resident Mode. In Guest mode Once you reboot, you will lose all the data and installations apps from your device. In Resident mode, it will save the data and System Configurations for next time and it can take 5 - 10 minutes to install. Congratulations, Now You can run Remix OS with Windows 7, 8, 8.1, 10 PC/ Notebook with Dual Boot. Share this Tutorial with your friends and family. Which android apps does it come pre-installed with? I install Remix OS, but have a problem.... It freezes on the home screen logo "Remix OS"